Mother nature is so clever ..
"all things bright and beautiful" ! Its poking its yellow tongue out at you TT LOL. as Meanie says .. addictive .. Lol. Wow, that is a gorgeous blue!!! I don't think they look scary... Lol. Thanks Kasy... and the camera has caught the correct colours, which helps ! Lol. great photo TT. How's your back today? Hi Karen .. Thanks for asking. Back is still very sore, but at least I can move about today ! Mother nature is indeed truly wonderful! Mother nature is healing my back as fast as possible ... with the help of yet more chocolate liqueurs ...Lol. how "dwarf" is it, TT? Looks like another one to put on my must-have list! These are only about 3 or 4 inches high. Glad to hear you are feeling a bit better,Terra..you need to have a double dosage...you can never have too much of a good thing ..Lol. Is it okay to "mix my drinks" ? ... in other words, a whisky liqueur chocolate, followed by a brandy one. Lol. Definitely Terra..the chocolate bit can be the chaser ! Lol. That is so beautiful TT , such a fabulous colour blue ! Colours very vivid on these ..
Gorgeous colour, TT. Glad your back is feeling a bit better. Take care of it. My dogs have missed training for 3 consecutive days now, so I must get better quickly ! get OH to make you an updated soapbox and harness 'em to it! ooh, can we have pics???? Chocolate Liqueur......whooooooooooo yuuuummmmmyyyy! :)) Great painkiller too! yes, I see exactly what you mean. Thanks ! This little Iris was in a bag marked "Iris Dwarf Mixed" so I don't even know the name of this lovely iris ! Terra if you are out of sorts always follow with a brandy !! I searched for "dwrf iris" and the only one I cuold find was on Shoot - Iris 'Violet Beauty' (Dwarf iris 'Violet Beauty') - of course I don't know that this is it, but it certainly lives up to the name! Hope the back is completely better very soon too! ... hoping for a cure ... Lol. Very pretty and taken at an unsual clever angle - it seems to make the bright colours stand out even more. I'll have to bring up the two side by side and compare them! RHS had nothing for Iris Retiucated Harmony, Iris Harmony, Iris Reticulted - and I didn't facny wading through 10+ pages of just Iris! Thanks. I love these dwarf irises. Just lovely , Tt , I thought that the back might have been hurt by taking the pic . It does't take much to start it off , I know . Have you tried Volterol ? Feel better very soon , the chocs must be helping some ! Hi Driad .. Glad you like this. For a bad back. I find that if you can put something freezing ie small bag frozen peas if you have nothing else (don't use again for food but can refreeze for back!!!) or a special gel filled pouch (which is frozen but not solid) onto the place where it hurts it helps to take the inflamation away. You see the tennis players with those ice pack on the bits that hurt. I keep a small pouch in the freezer ready!!! I also find arnica cream is good. Useful information Jen ... Thank you. Yes, the tennis players do use ice, don't they .. good idea ! 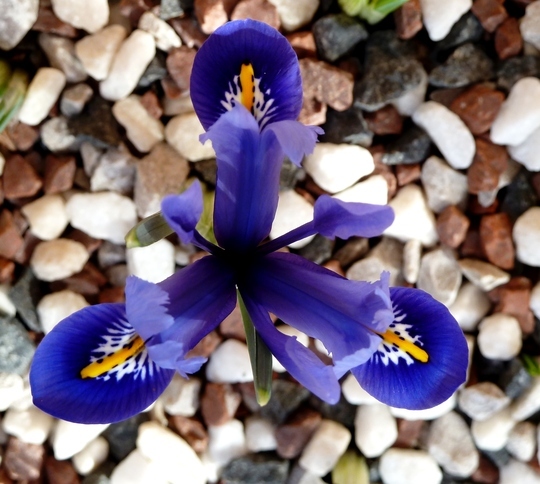 A really lovely dwarf Iris, TT! I love these little flowers but haven't grown them in donkey's years! Hope your back is improving as the weather is forecast to get a little warmer again over the weekend & you'll be raring to get out there &do some gardening! I'm very keen to get outside gardening again. So much to do out there. beautiful picture, hope the chocolate cure is working on the back pain...i find it cures most ailments if you eat enough! When I first started to have pain in muscles etc. It was suggested cold may help well I shot to the roof! such deep bone aching pain....like nagging toothache.....heat works for me sometimes.....fascinating isn't it. Heat works for me on my back and cold for swollen feet and legs. I put a flat board type pack which is for putting in cold boxes in the freezer. Put a towel over it on a raised stool and rest my legs for about 1/2 hour covered up to concentrate the coldness. Works a treat, especially in a heatwave!. Thank you, Gardzin, Maezy, Diamond and Tantita. I like the dwarf type of Iris. My hip/back pain is easing now thanks Pete, Pam and Dorjac. I'm trying to move around, though ... not spending too long at the computer at one time ! So sorry your back is playing up at this time of the year TT. I hope your garden can be kept in order. Every time I do something this year I ache. I don't remember it being so persistent before but it goes away after a rest with a hot water bottle.. Sometimes it's such a small movement that sets off the discomfort. That's a pity you have aches and pains. I was surprised yesterday when my back/hip pain eased after persisting only a week or so. I was expecting the pain to last a lot longer. I don't know how I missed these pics. Sorry to comment so late, but this is (was) a beautiful colour.